These are some of the most common questions we get asked about water softeners. This article is our answer to these questions or any other questions you may ask. It will give you an overview of the home water softening system, how it works, and what you should take into consideration before you buy a water softener for your home. In short, this is our most comprehensive buying guide to choosing the best water softener for hard water problems. Water softeners come in an array of sizes, types, capacities, prices and brands – choosing the right water softener for your home can be a daunting task. To help you narrow down your choice, we spent many hours researching and evaluating some of the best water softeners on the market that we think you should buy. These units come from top water softener manufacturers in the world that have been proven to work effectively and reliably. Most of the water softeners we’ve reviewed are salt-based, whole-house, ion/cation exchange units. This is also the most popular type of water softener and also the most appropriate choice for softening hard water in the United State. We also evaluated some of the best salt-free (saltless) water softeners and magnetic water conditioners. They are excellent options to consider if you’re looking for an alternative to salt water softeners. How to choose the right water softener? Now, before we go deeper into our water softener buying guide, let’s take a look at our picks of the best whole house water softener systems on the market. First, this is one of the most popular water softeners on the market that is using by many homeowners. Most homeowners claimed that it was extremely effective in removing hardness of the water and it caused their skin and hair to feel softer, the taste of water was improved significantly, and calcium deposits in pipes and fixtures were completely removed. They could actually feel a remarkable change in the quality of water after installing the unit. Secondly, the Fleck 5600SXT 48,000 Grain uses the Fleck 5600sxt Digital Valve, which is the most popular water softener control valve on the planet. This digital control valve provides a top-of-the-line experience with more efficiency and control than most other control heads on the market. Fleck 5600sxt Digital Valve is designed to meet rigorous fatigue standards, passing 250,000 pressure cycles at up to 190 psi, as well as 10,000 complete regeneration cycles. It is able to handle flow rates up to 20 gallons per minute and is made to provide the backwash capacity for softeners up to 12″ in diameter and filters up to a 10″ diameter. As you’ll see when looking around, at least 60 percent of whole house water softeners on the market today are built with Fleck control valves. Thirdly, the Fleck 5600SXT 48,000 Grain Water Softener is designed to be a DIY product. It’s very easy to install. Most of its owners installed by themselves with just a few basic plumbing skills. They said it took just about 4-5 hours to complete the installation process. You can do it yourself and don’t need to hire a plumber that might cost you hundreds of dollars. Lastly, this whole house water softener is a “MADE IN THE USA” product. It’s made with quality and reliability in mind. Fleck makes a large number of water softener systems for both residential and commercial applications. This is one of the best water softener brands in the world and you can definitely trust. Our top pick is a standard water softener that has 2 tanks: a mineral tank that contains resin beads and a brine tank that contains the salt. It essentially treats the water and removes the hardness and minerals through an ion exchange process. 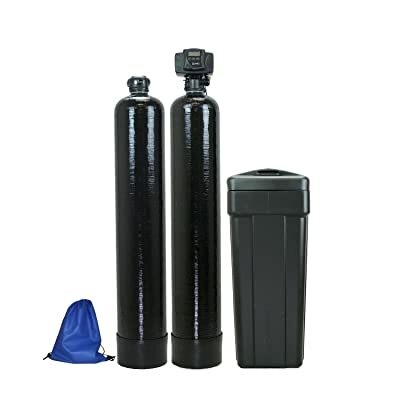 This is the best water softener for you if your main purpose when installing a water softening system is to eliminate the effects of hard water to your home’s water system. The ABCwaters built Fleck 5600sxt 48,000 Water Softener & Upflow Carbon Filtration, on the other hand, has one more tank – the Upflow non-backwashing carbon filter tank. 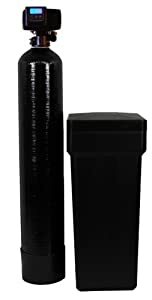 The carbon filter tank uses activated carbon which is a simple low-cost method for water filtration, protecting your household water from a number of different contaminants while removing odors, smells, and chlorine taste from the water. It also extends the life of your water softener resin beads. It does this by absorbing the chlorine from your city water source prior to entering your softener. 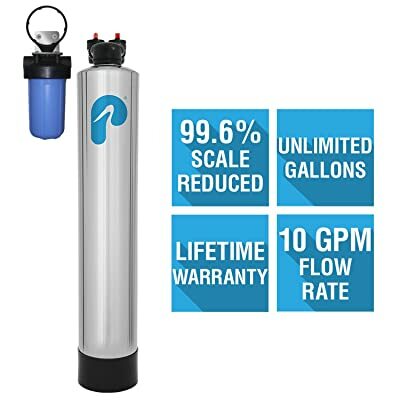 This upflow filter tank requires no electricity and require no drain connections to operate. The water simply enters the tank down the center of the tank and comes up through the activated carbon media, lifting the media to prevent any channeling. Because the carbon filter tank can remove a wide range of contaminants including chlorine and chloramines, as well as smell and odor, it will make the water taste significantly better. It will make you feel a lot more confident with the quality of water you’re drinking or cooking. We’ve also found that this whole house water softener system can effectively treat water sources with iron, like well water. This was also our choice as the best water softener for well water in another article. 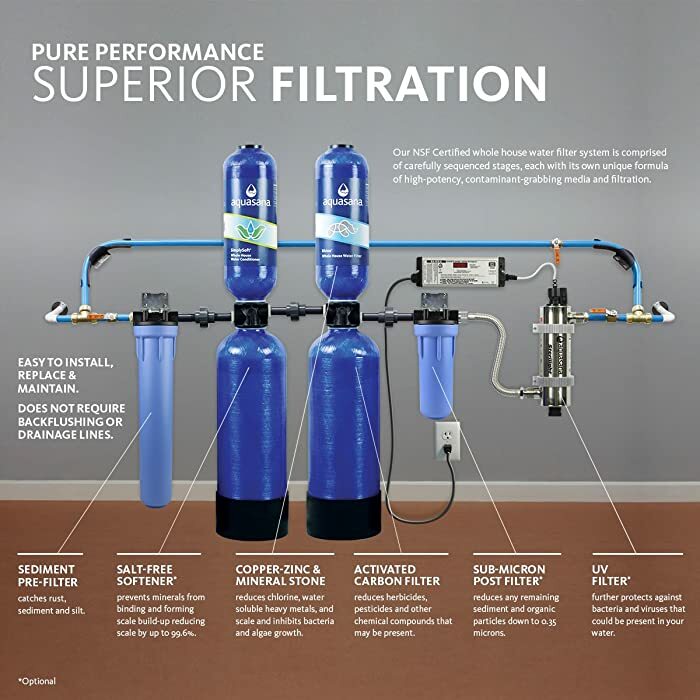 Overall, we think this is an excellent choice if you’re looking for the best whole house water filtration system for well water or city water sources that have a lot of Chlorine, Iron, smell, and other contaminants. And if your family gets drinking from these water sources, your best bet is to install this unit with a Reverse Osmosis Water Filter. If there are stains or buildup on your sinks, bathtubs, and other home appliances such as tankless water heaters … if you have to use large amounts of soap to clean dishes or wash your hair … or if your water tastes or smells odd, you probably have hard water problems. But what’s hard water? Hard water is water that is contaminated with dissolved calcium and magnesium ions. These minerals become less soluble at high temperatures and form a white precipitate (solid). This characteristic is what causes most of the problems with hardness. Probably the most recognizable symptom of hard water is the white, flaky buildup often found on the kitchen faucets, bathroom faucets, shower heads, and other plumbing fixtures. Scale is also found inside of those plumbing fixtures, as well as inside of pipes and appliances like water heaters or dishwashers. As rainwater falls, it is naturally soft. However, as water makes its way through the ground and into our waterways, it picks up minerals like chalk, lime and mostly calcium and magnesium. Calcium and magnesium dissolved in water are the two most common minerals that make water “hard.” The degree of hardness becomes greater as the calcium and magnesium content increases and is related to the concentration of multivalent cations dissolved in the water. The negative impacts of hard water on your home’s water system and the health of your family members are the primary reason why you should invest in the best water softener. Hard water interferes with almost every cleaning task from laundering and dishwashing to bathing and personal care. Clothes laundered in hard water may feel harsh and scratchy. When doing laundry in hard water, soap curds lodge in fabric during washing to make fabric stiff and rough. Incomplete soil removal from laundry causes graying of white fabric and the loss of brightness in colors. A sour odor can develop in clothes. Some powdered detergents have ingredients that combine with hard water minerals to leave a white deposit on clothing, making it look faded. Continuous laundering in hard water can also shorten the life of clothes. Hard water can cause skin and hair problems. Eczema in children has been linked to hard water. Many people who bathe with hard water notice dry skin and even hard or bumpy patches of skin caused by dryness and irritation from skin and hair products. The many minerals that are present in hard water mean that the cleansing products used while showering don’t dissolve well in the water. This can lead to them irritating the skin when they don’t rinse off the skin well. Using the best water softener can get rid of some of the minerals dissolved into the water and make it easier for shampoos and soaps to dissolve in the water and rinse cleanly from the skin. Drinking hard water can make you sick. According to the International Journal of Preventative Medicine, the regular exposure to the density of minerals in hard water has many ill effects on the health of those who drink it. High levels of calcium and magnesium can affect several organs in the body and cause health problems. One of the most severe effects of hard water is an increased risk of cardiovascular disease. According to several international studies, both heart disease and high blood pressure can be caused by drinking hard water. There is also an increased risk of certain types of cancer for those who drink hard water. Therefore, having the best water softener system in your home is one of the best ways to protect your family health. Scale from hard water also significantly reduces the lifespan of appliances in your home. The heavy presence of minerals in hard water often leads to pipes becoming clogged. With clogged pipes, your appliances will run less efficiently. This often leads to higher energy bills and even damaged appliances. The clogs can lead to leaks in the pipes and shorten the lifespan of your appliances. By some estimates, your appliances may work only half as long as they might have if a water softener had been used. In the Bathroom: Your soap and shampoo will lather better. Your hair and skin will feel noticeably cleaner, softer, and not as dry. And there will be no soap scum or mineral deposits to clean off sinks, showers, tubs, and toilets. In the Kitchen: Dishes will clean up more easily, and be spot free, without the gray film glasses get when etched by mineral-laden water. Plus hands will feel softer and look better. In the Laundry: Clothes will be softer, cleaner, whiter and brighter. Plus they will last longer. Using soft water and pure soap products increases the life of clothing, towels, and linens up to 33%. Without hard water service issues, washing machines last longer, too. Throughout the House: Water-using appliances will last longer and run better. Why? Because hot water heaters, washing machines and dishwashers used with hard water can wear out 30% faster. Over time, soft water savings can really add up. For instance, conditioned water not only delivers greater washing powder, but it also reduces the amount of soap you need to use by up to 70%. In fact, you can save between 17 and 20.8 cents of every dollar spent on cleaning products. Water softening system can reduce that bill by up to 65%. It can also eliminate extra rinse cycles and hot water. Plus using less detergent, household cleaners and chemicals is better for the environment. In brief, a water softening system will save you a lot of money in the long run. Salt or salt-based water softeners, such as the Fleck 5600SXT 48,000 Grain Water Softener, are the most popular type of water softening systems on the market today. Most households in the US are using this type for their home water filtration system. As you’ll see below, most of the best water softener systems reviewed in this article are salt-based units. A salt water softener operates on the principle of ion exchange. A synthetic resin (zeolite) bead is charged with sodium ions by regeneration with salt (sodium chloride). Hard water, containing calcium and magnesium ions, flows through the resin. Ion exchange occurs when the calcium and magnesium ions attach themselves to the resin, displacing the sodium ions. The resultant water is softened, being free from calcium and magnesium. 1) The body of a water softener is a tank filled with resin beads. This is also called the resin tank. These resin beads are covered with sodium ions. The water softener pumps hard water through the resin tank, the resin beads act as a magnet, attracting the calcium and magnesium ions in exchange for the sodium ions. 3) During regeneration, a strong brine solution from the brine tank is flushed through the resin tank, bathing the resin beads in a stream of sodium ions which replace the accumulated calcium and magnesium ions. 4) The brine solution, carrying the displaced calcium and magnesium ions, is then flushed down the drain by fresh water. The regenerated resin beads can be used again and again. Water softening costs depend on factors such as installation, maintenance fees, and the size of the unit. You can also expect that with more convenience features, the price of the unit will increase. An average range for the hardware only is around $500-$1500. Single Tank vs. Twin Tank Water Softener – Which is Better? Before we look at our picks of the best salt-based water softeners on the market, it’s important to understand that there are two designs of salt-based water softeners you can buy: Single Tank Water Softeners and Twin Tank Water Softeners (also known as Dual Tank Water Softeners). Here is how both water softener designs work. Single tank means one resin tank and one brine tank. The resin tank can be put inside the brine tank, this is called a cabinet water softener but still a single tank. For example, the Whirlpool WHES30 30,000 Grain Water Softener is a cabinet-style water softener. This design helps saving space. Based on our experience, cabinet style water softeners are typically not as efficient as standard style water softeners, so they are not an appropriate choice for large-sized homes. They are usually used for hot water heater system. Twin tank means two resin tanks and a brine tank. Our second pick of the best whole house water softener – the ABCwaters built Fleck 5600sxt 48,000 Water Softener with Upflow Carbon – isn’t a twin tank water softener. As we described above, a single tank water softener is a system with 1 resin tank and 1 brine tank. The resin or mineral tank contains resin beads that remove the hard water minerals. The brine tank stores the salt. Single tank water softeners count how many gallons you use. Once you reach capacity, they regenerate in the middle of the night. During regeneration, the system goes into bypass. No soft water is available during this time. If you hit the limit in the middle of the day, you’d run out of soft water. You will have the same problems in the event of a power cut. Thus, if you opt for a single tank system, and you want to avoid running out of soft water, the best water softener system for you should be a system that has more capacity than you might need. You still run the risk of running out of soft water during very heavy water use, but your odds are improved. Twin tank water softeners, such as the USA Fleck 9100SXT Twin-Tank Water Softener, have 2 resin tanks and 1 brine or salt tank. As this system has two tanks instead of one tank as usual, when one tank has reached its capacity, the other one can take over, leaving the first free to be regenerated. Twin tank water softeners can soften water 24 hours a day because of this, making it more efficient than its single tank counterpart. But it’s also more expensive. Which is Better? Single Tank or Twin Tank? A common misconception, sometimes found on water treatment forums, is that twin tank water softeners are better than single tank water softeners when it comes to the quality of soft water. We think the only difference here between these two water softener types is that a twin tank unit can provide soft water 24/7, while a single tank unit needs to regenerate at night after a few days of usage. But who needs soft water in the middle of the night, right? For most the majority of consumers, a properly sized single tank water softener will provide more than enough soft water availability. Adding hundreds of dollars to your purchase to avoid running out of soft water in the middle of the night seem not to be a wise idea. But why do so many homeowners still opt for a twin tank water softener system? A twin-tank water softener system assures that there is always soft water available. The system always delivers soft water without interruption. Having a twin tank water softener system means you don’t have the risk of getting hard water into your home’s water system. It’s also worth noting that the benefits of softened water aren’t reserved for the daytime. Your home has water running through it at all hours and by ensuring all water entering your home is softened efficiently, your home can benefit from reduced bills and improved condition of appliances and pipes. Now, it’s time to look at our reviews for some of the best water softeners available to buy today. After spending many hours researching, asking experts, and surveying water softener owners, we’ve decided that the Fleck 5600SXT 48,000 Grain Water Softener is our pick for the best whole house water softener system for most average households (4-6 people) in the United State. This is also one of the most popular water softeners on the market, many homeowners are using it for their home water system and most of them gave it a positive review. 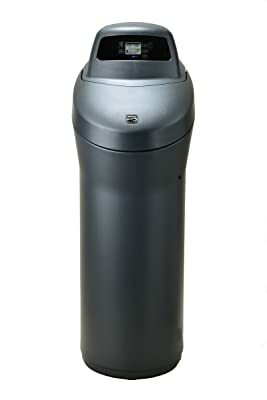 The Fleck 5600SXT 48,000 Grain Water Softener is packed with all of the top available features with the simplest mechanical design at an affordable price. With the most advanced features and a simple design for easy programming, this water softener is a “set and forget” system! No need to ever worry about reprogramming or resetting the time. This water softener uses the Fleck 5600SXT control head, which is the most popular control valve for water softeners on the market. This control valve is one of the most durable and best performing water softener valves ever created. The Fleck 5600SXT valve has a unique feature of an internal capacitor that will keep your time set for up to 48 hours in the event of a power outage. It also has a non-volatile memory standard that will never allow your system settings to ever be lost. You can custom set cycle settings for the most efficient salt settings saving you time and money. All this while still saving you up to 40% on salt usage over the standard timer systems of the past. The Fleck whole house water softener system is designed to be set up effortlessly from the external components to the programming. Now you won’t have to worry about being stressed during installation. You don’t have to spend extra money just to hire a plumber because you can set up on your own. All you need to do is follow the instructions in the manual, and you’ll be able to use the device in no time. Suitable for families of 3-5 persons. LCD display alternates between time of day, gallons of soft water remaining or days to regeneration. Fleck brand is owned by Pentair – one of the leaders in the water filtration industry. Fleck has been in the business of producing top-of-the-line water softeners for almost 50 years. The brand became popular in the water softening industry since their products were the first to use a powerhead meter for regulating the regeneration process in water softening devices. Fleck water softeners are among the best and most reliable water softener systems in the world. Today, Fleck has received countless high remarks due to their ability to produce high-efficiency devices in softening hard water. Almost all of their best whole house water softeners come with a five-year warranty and they have several models to offer with different configurations. They have been consistently recognized as one of the highly reputed brands and they are well-loved by many consumers all over the world. This ABCwaters 48,000 grains water softener system combines a whole house Water Softener and an Upflow Carbon Filter. Not only does this system eliminate hardness of the water, but it can also remove most of the unwanted contaminants, smell and odor, chlorine, as well as iron and manganese from the water. And it also makes water taste significantly better than a water softener system without an Upflow Carbon filter. As previously mentioned, this is one of the best water softener systems for well water with iron or city water that smells bad. You should purchase this system if there is a sign of an Iron & Chlorine presence in your water. And if your family gets drinking from unreliable water sources, a system that includes this unit and a Reverse Osmosis Water Filter might be the best whole house water filtration system for you at this time. ABCwaters packed these products in a great value package – ABCwaters Whole House Fleck 5600sxt Triple Combo. You can’t go wrong with this system. Note: if your family is living on well water, never install a water softener system without having a Sediment Water Filter. Filtration prior to softening ensures that most rusts, dusts, sands, and other sediments are trapped before they are processed in the softener. Sediment filters can effectively remove insoluble (not dissolvable) or suspended iron and manganese. Sediment filters alone do not effectively remove dissolved organic or inorganic material that may be harmful. They do not effectively remove nitrate, heavy metals, pesticides or trihalomethanes. 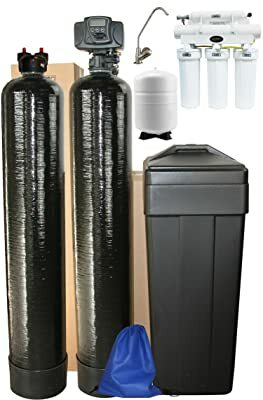 Sediment filters need to be used with other processes such as water softeners, activated carbon filtration, reverse osmosis, aeration, ozonation and chlorination. The ability to remove iron and Chlorine from the water of this water softening system also depends on its resin type. You can scroll straight down to the bottom of the article to read more about the water softener resin types. 8-10% Crosslink resin media – ideal for City water. Fine mesh resin media – ideal for Well water. If you have well water with HIGH LEVELS of iron, we would highly recommend you add this Air Injection Iron Filter as an iron pre-filter. This filter will remove most iron, sulfur, and manganese from your well water. It’s able to remove iron and manganese better than any other water filtration system we’ve ever seen. Keep in mind that the Air injection Iron Filter was not originally designed to remove chlorine, so you’ll still need a carbon filter to remove chlorine. And you don’t need to use it for city water. Removes a Wide Range of Contaminates: Iron, Chlorine, Pesticides, Herbicides, Organics, Most chemicals, Most Odors, Most Tastes. The Genesis Upflow Premier Water Softener from Discount Water Softeners is one of the best water softeners on the market when it comes to efficiency, quality, and durability. This line of high efficiency and high flow rate whole house water softeners utilize innovative technology, which provides better performance and higher efficiency than most standard water softener systems on the market. The Genesis Premier Upflow is a water softener is an Upflow water softening system that sets the new standard for high performance while offering more features designed to make installation easier and faster. All while saving you up to 75% on salt and 64% less water. The Fleck and Pentair water softeners are Downflow water softening systems. A Downflow softener system directs the water in them from its entrance into the tank, through an upper basket, then flows down and around the outside of the system’s distributor tube and through the water’s resin. After the water flows through the resin, it continues into the lower basket found at the bottom of the riser tube. From there it travels up that tube and exits the tank. An Upflow softener system, on the other hand, directs the water in an upflow fashion. The water flows from the tank bottom in a swirling motion up through the resin. This allows the system to use less salt and water. An Upflow water softener system also drives hardness away from the resin to the drain instead of downflow that forces “dirty” water through the clean charged resin. This technology has been proven to reduce salt and water usage over standard downflow type systems. Another key feature that makes the Genesis Premier Upflow one of the best whole house water softeners on the market is its smart digital control valve. This digital control valve provides precise brining customized to your water source reducing salt usage. It features a “No Touch” information display that rotates key information, flow rates, the last regeneration date and volume remaining until the next regeneration. It also has a non-volatile memory standard that will never allow your system settings to ever be lost. You can custom set cycle settings for the most efficient salt settings saving you time and money. This control valve also features Soft Water Recharge Mode and Automatic Backwash Variable Preset. Soft Water Recharge Mode ensures soft water during usually heavy water usage; Automatic Backwash Variable Preset for clean municipal water by matching backwash frequency to water quality need saving you up to 2000 gallons of water annually. Available in a range of capacity: from 24,000 grains to 96,000 grains. If you have a family of 3-6 members, the best water softener for you is in the 40,000-48,000 range. The Genesis Upflow Premier Water Softener is one of the best whole house water softener systems we’ve found. This system utilizes innovative upflow technology that provides unmatched performance and savings. It costs more than a Fleck’s water softener but will save you a few hundred dollars on salt and water. In addition, the Genesis line has a longer warranty that covers 100% of all parts on the control head and you receive a lifetime warranty on the resin and brine tanks. The Whirlpool WHES30 30,000 Grain Water Softener is our choice of the best water softener for small-sized homes with 1-3 people. This compact water softener features Whirlpool’s 6th Sense technologies which “learn” and “predict” your water usage to regenerate only when you need it and automatically calculates how much salt to use, minimizing your water and salt usage. This water softener can remove a maximum of 95 GPM of hardness and up to 8 PPM of iron. But we recommend you not to use this water softener for well water. Based on our experience, cabinet-style water softeners aren’t suitable for filtering well water with iron, because it’s not powerful enough to remove iron and other contaminants in well water. The purpose of the Whirlpool WHES30 water softener is to treat water hardness. It operates based on commands set into its digital programming and display screen. The softener comes with a full one-year warranty, as well as three- to 10-year limited warranties for various components. The Premier Series Water Softener is the best water softener from Kinetico Water Systems – a company that offers industry-leading water softeners and reverse osmosis systems. Kinetico water softeners have a high quality, are low maintenance and designed to deliver worry-free operation for years. But the Kinetico water softeners are not for everyone, these systems are super expensive that can cost you thousands of dollars upfront for a complete system. And if you’re considering purchasing a new Kinetico system for your home, you will need to contact a local Kinetico specialist who will give you a price quote. Because the company doesn’t sell their water softeners as well as replacement parts directly to the public. The Kinetico Premier Series water softener is a non-electric water softening system which is powered by moving water and have multiple tanks for continuous soft water, even during regeneration. These high-flow systems are comprised of multiple tanks, so you’ll have a continuous supply of soft, clean water. One tank is always in service while the other tank is either on standby or regenerating. Premier Series systems regenerate at any time of the day or night to ensure you will always have a supply of soft water. Single-tank systems simply can’t offer this. So if you have a house full of guests or are running multiple loads of laundry, you’ll never run out of soft water. And if you’re away from home, the system stays ready without wasting water or salt. We’re confident the Kinetico Premier Series is one of the most advanced and best water softeners for the whole house you can buy. But sometimes, the price and the value don’t go together. Nowadays, you can even get a very high-quality system at a much cheaper price. A premium whole house water softener system like the Kinetico Premier Series can easily last for up to 20 to 25 years, but the initial investment is a few thousand dollars. The average life of a basic softening system, like the Fleck 5600SXT water softener, is 15 years and might be up to 20 years if maintained properly, but only costs for about $500-$1000. If you like to have a system that is able to supply endless soft water, the Fleck 9100SXT Dual Tank Water Softener is one of the best water softener systems you can get. With a twin-tank system featuring the new Fleck 9100 valve, this unit can provide soft water 24/7. That’s because the second tank of soft water acts as a backup, ready to immediately provide soft water once 100% of the first tank is used. While the second tank is in service, the first tank regenerates, giving you all the advantages of continuous soft water. The Fleck 9100SXT dual tank has two mineral tanks, 32,000 grains per tank with a total of 64000 grains both tanks. 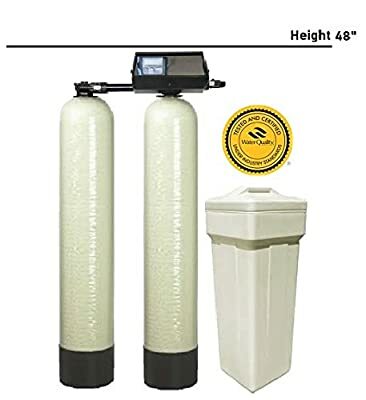 Built with structural composite tanks, brine tank safety float, and 10% crosslink resin, this water softener is ideal for a large family with 6-8 members, or for an average family with extremely hard water, or for many light commercial applications. Overall, we think if you are looking for a whole house water softener system that can provide uninterrupted soft water even under the most demanding conditions, a dual tank system will likely be your best bet. There are several different sizes you can choose from, all are available on Amazon.com. 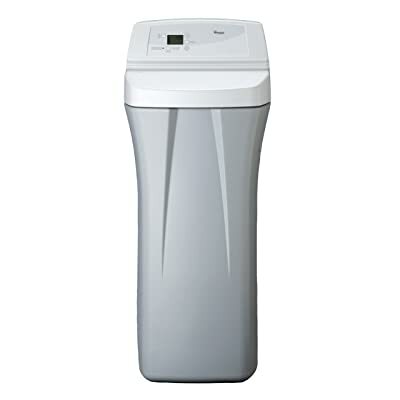 The Kenmore Elite Smart Hybrid Water Softener is a salt-based whole house water softening system with a 41,000-grain capacity that is suitable for a family of 3 to 4 people with city water. This unit is built-in wireless capability enables you to manage your water softener from your smartphone. It allows you to track salt levels, excessive water use and potential issues like excessive and continuous water flow. You can view average daily water intake and receive alerts for low salt levels, ways to cut back on water usage to save money and unexpected, continuous water flow. This Kenmore water softener is a great choice if you’re looking for a smart, yet easy to use, water softener that allows you to control everything from your phone. This smart water softener will help you avoid running out of salt unexpectedly, saving money and time. Kenmore is one of the most trusted brands in the world. If you’re looking for the best water softener for your home filtration system, this is the brand you can trust. Culligan is one of the most recognizable and biggest brands in the water softening industry. The company offers some of the best whole house water softening and filtration systems on the market. Like Kinetico water softeners, Culligan water softeners are incredibly expensive. This could be part of the reason why they don’t list financial information on their website, which means that it’s almost impossible to find out how much one will cost. But as far as we know, the average cost of a Culligan water softener can go as high as $2000-$5000, depending on the options chosen. This isn’t including the installation cost yet. The HE Water Softener is the Culligan’s high-efficiency salt-based water softener. This softener features Aqua-Sensors smart technology which automatically adjusts to changes in water conditions so the softener only regenerates when needed, saving you salt and water. Culligan claimed that this water softener is up to 46% lower operating costs than time-clock regeneration softeners. Smart brine tank automatically monitors salt levels and tells you how many days of salt are remaining. Exclusive Culligan Soft-Minder meter monitors daily water use and provides advanced system diagnostics. Salt-based water softening process is an ion-exchange process. This is the most effective method to remove hardness minerals from the water. The softener grabs onto calcium and magnesium compounds and exchanges them for another ion – usually sodium. However, using sodium-based product results in an increase in the sodium concentration of the soft water. Many people don’t like it, especially those are on low sodium diets or have heart or circulation problems. Even though the Mayo Clinic confirmed that the added sodium shouldn’t be an issue for most healthy adults. Many people are still concerned that eating sodium from water softeners can cause health problems, and they do not want to deal with any salt/chemicals. This is where the salt-free water softeners come in. What is a salt-free water softener? How does it work? Is it the best water softener for your whole house filtration system? If you’re looking for the best salt-free water softener for your home, here are what you should know before you purchase. How Does a Salt-Free Water Softener Work? “Salt-free” water softeners do not soften the water, they condition the water. They are also known as “water conditioners”. In the salt-based softening process above, an ion-exchange resin inside the softener attracts calcium and magnesium from the water, and replaces them with sodium ions from the exchange resin. Salt-based water softeners will actually remove hardness minerals from the water. In comparison, salt-free water softeners produce a catalytic reaction to convert calcium and magnesium in water to firm calcite crystals which are then carried away by the water flow once they reach a sufficient size (the nanometer range). Thus, saltless water softeners do not physically remove water hardness, but change the dissolved calcium carbonate into a type of calcite crystal that cannot attach to pipes or appliances to create hardness deposits. The major advantage of saltless water softening is reducing health problems associated with sodium, as the salt-free water softeners will not add additional chemicals or salt to the water during treatment. The best salt-free water softeners will show you the same effects as with your salt-based water softener, except that your water may not have that slippery, slimy feeling often reported with soft water because salt-free water softeners don’t remove hardness, but crystallize it. You’ll also notice the water will taste and feel better compared to standard sodium softened water due to the reduced concentration of sodium in the water. Salt-free water softeners also require less maintenance than standard water softeners because they don’t need to be back-washed or regenerated and don’t require electricity to operate – this makes them cheaper due to decreased water and energy usage, and eliminates the need to replace the brine solution, further increasing your savings over a normal water softener. And if you drain brine from the water softener into the basement sump pit, a salt free water softener may be a better choice. Most manufacturers of sump pumps discourage the use of sump pits to discharge brine from the water softener system. The corrosive action of salt water may damage the cast-iron pump body as well as the stainless steel pump shaft and the pump impeller. One concern with salt-free water softener systems is that even though they prevent solids from building up around your home, they’re not as effective in places where water sits, like the storage hot water heater. Those areas can still get a buildup of limescale. Typical salt-free water softeners do not manage bacteria, hydrogen sulfide, silt or sand, lead, nitrate, chlorine, and many other organic and inorganic compounds. These contaminants can be treated by a salt-based water softening system like the ABCwaters Triple Combo Whole House Fleck 5600sxt. Typical salt-free water conditioners are also not designed to remove iron and manganese, requiring pre-filter of the water or an appropriate ion-exchange water softener to remove them. Thus, we generally do not recommend using a typical salt-free water softener for well water or city water sources with a lot of iron and manganese. The only salt-free water softener unit on the market that is powerful enough to soften well water is the Aquasana 5-Year, 500,000 Gallon Well Water Whole House Filtration System. We rated this system as one of the best whole house water filter for well waters. 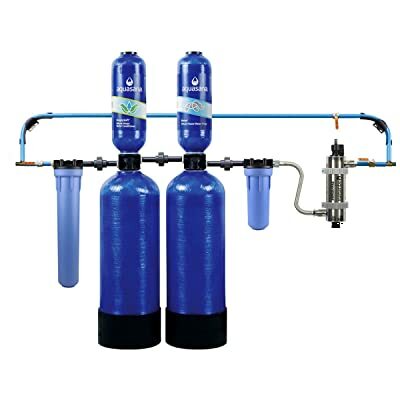 This Aquasana Whole House Filtration System is a six-stage process filtration system that combines a pre-filter, a water well filter, a salt-free water softener, and a UV filter in one package. This system is designed specifically for well water contamination to protect from bacteria, viruses and other contaminants commonly found in private well water. It is able to remove iron, foul tastes and odors, Chlorine, as well as the hardness from well water. You’re on low sodium or potassium diets or have heart or circulation problems. Your main purpose of using a water softening system is to stop the minerals from being deposited on the inside of your pipes, sinks, bathtubs, dishwasher and washing machine. You want minerals in the water. The best salt water softeners will remove most of the minerals in your water, some minerals can be beneficial to your health. Salt-free systems do not remove these chemicals, they simple crystalize them to eliminate the problems of hard water while leaving these healthy minerals in the water for consumption. You want to keep your overall costs minimized. Salt-based systems require electricity, ongoing salt, and other chemicals, plus use much more water. All will cost you money. A salt-free system uses less water and requires no salt or electricity, so they cost less to operate. You’re on well water with heavy Iron, or you’re using city water with a large amount of hardness. You want to use your water softener for your hot water heater. As mentioned in the previous section, salt-free water softeners are not effective in places where water sits, like in your water heater, whether it’s tank or tankless water heater. You will still see a buildup of lime scale. Your salt-based water softener can be used with Potassium Chloride. Potassium chloride is considered a healthy nutrient for humans. Most of the best water softeners we suggested above can use Potassium as an alternative to sodium salt. Salt-free water softeners or conditioners can embrace a lot of devices and technologies… some very good, some not so good, and some outright silly! Here is our list of some of the best salt-free water softeners on the market that worth your consideration. If you’re looking for the best water softener that can effectively soften your water without using salt, the Pelican NS3 NaturSoft Salt-Free Water Softener system is an excellent choice to consider. This is a premium salt-free water softener/conditioner. It is ideal for homes with 1-3 bathrooms and it’s certified for 99.6% scale prevention and offers a limited lifetime warranty. The Pelican NS3 NaturSoft is WQA tested and certified according to NSF/ANSI 61. It leaves in beneficial minerals and naturally softens water without salt, conditioning water without the slippery feel. The NaturSoft media has calcium carbonate crystal structures on its surface that will attract excess dissolved hardness and remove it from solution by integrating it into the crystal structures on the media. This results in the crystals on the media surface to grow larger. The movement of water and friction among the individual media granules rubbing against each other will cause fragments of these newly grown crystal structures to be fragmented off the media and released into the passing water. Overall, if you’re looking for the best salt-free water softener for your home water filtration system, you will be happy with the Pelican NaturSoft Salt-Free Water Softener. The Aquasana SimplySoft Series is an ideal salt-free water softener system for average households with city water. This system has a lower price than the Pelican NaturSoft but we’ve found that it’s very effective in reducing the effects of scale buildup in plumbing and appliances. Aquasana SimplySoft uses innovative SLOW PHOS salt-free water softening technology to naturally condition your water and protect your pipes from corrosion without the use of added sodium. As its name implies, SLOW PHOS uses food grade polyphosphate beads engineered to dissolve at a controlled (or “slow”) concentration to effectively target scale producing hard mineral carbonate crystals including calcium, magnesium, and barium. Aquasana SimplySoft is designed to handle hardness levels below 25 gpg and works best with hardness levels at 15 gpg or below. This salt-free water softener system has a dual tank design. This design increases water contact time with contaminant grabbing media and prevents clogging or media channeling. The system also features a sediment pre-filter, which catches rust, sediment, and silt from the water before it goes through the softener. The Aquasana SimplySoft does not require electricity, drainage for wastewater, or complicated salt replacement. This system is very easy to install and can last up to 6 years. We think this is easily one of the best salt-free water softeners and conditioners for city water on the market. The Aquasana 500,000 Gal Well Water Rhino is the best whole house water filtration system with a salt-free water conditioner for well water we’ve found. This system is designed specifically for well water contamination to protect from bacteria, viruses and other contaminants commonly found in private well water. 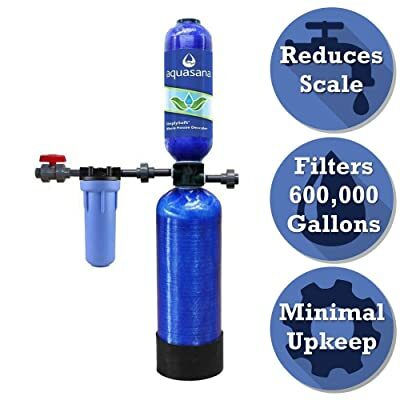 The Aquasana 500,000 Gal Well Water Rhino includes a whole house water filter, SimplySoft salt-free water softener, 20″ pre-filter, sub-micron post-filter, and Sterilight Ultraviolet Filter. 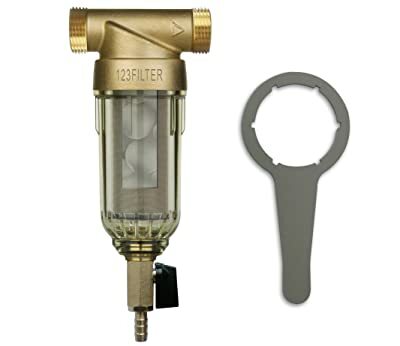 20-in sediment pre-filter: prevents dirt and sediment particles from entering and clogging the main filter unit. SimplySoft salt-free water softener: prevents minerals from binding and forming scale build-up. Sub-micron post filter: reduces any remaining sediment and organic particles down to 0.35 microns. Powerful UV Sterilight Filtration: uses ultraviolet radiation to sanitize drinking water as it passes through the system, which changes the DNA structure of microbiological contaminants and cysts. UV light radiation also prevents bacteria and viruses from reproducing, and microbiological contaminants cannot survive without constant reproduction. Aquasana claims this UV filter can eliminate up to 99.99% of viruses, bacteria like E. Coli in well water. The Aquasana 500,000 Gal Well Water Rhino is the best salt-free water softener for well water we’ve found. Although we think this filtration system is not as effective as the ABCwaters Whole House Fleck 5600sxt Triple Combo when it comes to treating well water with iron and smell, this is still a decent option to consider if a salt-free water softener system is what you’re looking for. If you’re on city water and looking for a whole house filtration system with a salt-free water softener, the decision is a no-brainer. There are three different types of water softeners: Ion-exchange (salt-based), salt-free, and magnetic. Ion exchange water softeners exchange the ions in the water with sodium or potassium ions. This is the most popular type of water softeners. Salt-free water softeners use a filter so no chemicals, potassium or salt is required. This is ideal for those who don’t want to use salt. What is a magnetic water softener? Is this the best water softener system for your home? How a Magnetic Water Softener Works? Magnetic water softeners, also known as electronic descalers or magnetic water conditioners, use electromagnetic devices for water treatment. This is still a controversial method. The idea behind magnetic water softeners is if you attach powerful magnets to the outsides of the pipe, before the water enters your plumbing system, the magnets will pull or otherwise affect the ions found in your water; preventing scale buildup in your pipes. A number of studies have reported on magnetic water treatment, but with varying results. There is no scientific consensus as to the effectiveness of magnetic water treatment and its removal mechanisms. Thus, magnetic water treatment, unlike the other technologies previously described, should be regarded as unproven technology without a strong scientific basis. Magnetic water softeners/conditioners do not remove any of the natural minerals contained in the water. Each type of water softener has its pros and cons. Here are the things to consider when deciding whether a magnetic water softener is right for you. They tend to have a long life – the best magnetic water softeners can last as long as 30 years. Magnetic water conditioners help to prevent scaling but don’t add any sodium or potassium to your drinking water. Magnetic water softeners don’t actually remove hardness minerals from your water. Instead, they alter the chemical composition of the water to prevent scaling. There is little scientific evidence to suggest that magnetic water softeners are effective at softening water. Like salt-free water softeners, magnetic water softeners won’t help prevent scaling in places where water sit, like your hot water heater. Should I Use a Magnetic Water Softener? It all depends on your family’s needs! If you only want to use your water softener to protect your whole piping system, sinks, toilets, showers, and other appliances against scale deposits, then a magnetic water softener is a perfect choice. This is also the most cost-effective solution. Using a magnetic water softener with your pressure washer machine will help you reduce water spots after washing your car. If you have serious problems resulting from hard water, you should invest in a system that you know will work for you. Salt water softeners have proven themselves over the years (based on our experience, this the best water softener for very hard water). Salt-free water softeners also do a good job. Either of these options will cost you more, but you can count on them to work. You should never use a magnetic water treatment for well water, city water with a lot of iron, bacteria, chlorine, or other unwanted contaminants. And also don’t use it for your hot water heater. Now, if you think of buying a magnetic water treatment, here are our picks of the best magnetic water softeners/conditioners or descalers on the market. 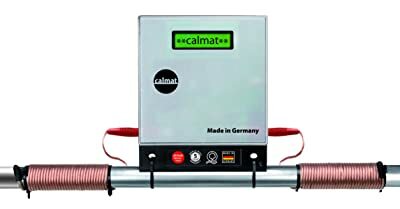 The Calmat Electronic Anti-Scale Rust Water Treatment System is our choice for the best magnetic water conditioner for most people. This German-made descaler stands out with its quality and performance. The Calmat uses customized isolated copper impulse cables. The secret to a maximized performance is not only the impulse composition but it is also determined by how that is transferred onto the pipe. The Calmat impulse cables are specially manufactured and contain a high number of single individual copper cables inside. The more single cables, the more powerful the transfer. Calmat works on a frequency range between 3-32 kHz with different frequency peaks (wobbling distribution). The secret to the right performance of physical water treatment lies in the composition of these impulses. Calmat water conditioner is designed with an isolated plastic frame that withstands water and humidity. Furthermore: Unlike many other products where you face a black box that prevents you to understand what lies inside that product, Calmat comes with a transparent top that allows seeing what the product consists of. The automatic memory program keeps Calmat water conditioner running correctly. In case of the unlikely event of a power failure, Calmat automatically resets back to the last program once power is regained. The Calmat Electronic Anti-Scale Rust Water Treatment System is the most effective magnetic water treatment we’ve found. This is the best magnetic water conditioner to buy today. This unit operates on 100-240V, 50/60 Hz, and 4.3 Watts. Maximum supported pipe diameter is 1-1/2″. Maximum flow rate is 13 gpm. Please note that this descaler does NOT remove rust from the water. The Eddy Electronic Water Descaler is one of the most popular magnetic water softeners on the market. Eddy offers up to 12 months 100% “no quibble” money-back guarantee plus lifetime replacement warranty for this unit. This is a great deal and certainly worth your consideration. The Eddy water descaler is very easy to install, it requires NO plumbing skills. You just have to have an outlet nearby and you need to install close to where your water enters the house. When it’s installed, you will have two coils that sit neatly around your incoming water supply pipes. The produced magnetic waves break down compounds that turn into limescale. This means it will no longer stick to the inside of your pipes. This descaler is ideal for homes with 2-3 bathrooms. It runs on a 110 Volt supply. The power usage is minimal and runs at just 5 Watts. If you think about the average light bulb being rated at 40 Watts then you can see the electricity costs are small. 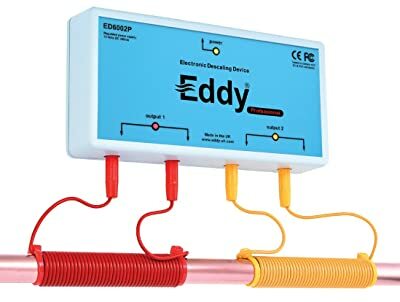 The Eddy Electronic Water Descaler is one of the best magnetic water softeners/conditioners on the market. It’s affordable, maintenance-free, and very easy to install and use. The HydroFLOW S38 Electronic Water Softener is designed for both residential and small commercial applications. This water conditioner fits pipes up to 32mm (1.25”) outer diameter and is intended to be used for commercial kitchens and/or homes up to 3,000 sq/ft. 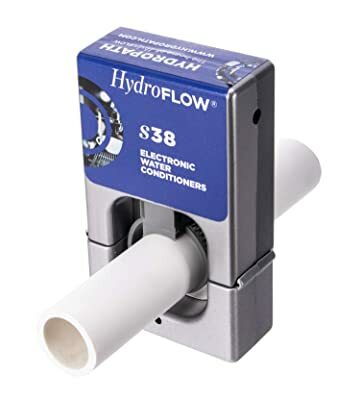 HydroFLOW S38 is powered by the patented and eco-friendly Hydropath Technology, which were originally designed to treat scale related problems in residential plumbing systems and appliances. Many tests showed that compared to other technologies, Hydropath Technology is more efficient and effective. This technology also allows the water conditioner to treat water at a high flow rate. Designed for ease of installation, the unit is simply built around the pipe and connected via the power supply unit. It is designed to work with many different types of pipe that could be installed in your house. You can use it with PVC, Copper, Galvanized, and PEX. This unit operates at 110-240V AC, 1.2W max power. What’s the best salt to use in my water softener? It’s a question we get asked many times. There are 2 different types of salt available for water softeners: sodium chloride and potassium chloride. Since the beginning, sodium chloride has been a common source of regenerant for salt-based water softeners. Potassium chloride is marketed as an alternative to sodium-based products. This type of water softener salt has slowly earned its reputation due to its health-giving properties as well as the benefits it can bring to the environment. Sodium chloride is typically used only for water softeners. The majority of water softeners are designed for this type of salt. This type of water softener salt can be found in a variety of forms, such as rock salts, solar salts, and salt pellets. Salt pellets are the preferred salt for most water softening applications. Salt pellets are slightly more expensive than rock salt and solar salt, but because of their exceptional purity, you’ll rarely experience bridging or mushing, and you’ll likely never have to clean out your brine tank over its entire lifespan. Rock salt is mined from the ground like other minerals, and generally contains the greatest level of impurities. This type of salt is inexpensive but it’s not a good choice for water softening. Solar salt, or as known as sea salt, tends to be cleaner than rock salt but does not have the same purity level as salt pellets. So, if you use sodium chloride for your water softener, salt pellet is the best water softener salt to use. The best water softener salt pellets on the market are from Morton Salt and Diamond Crystal. 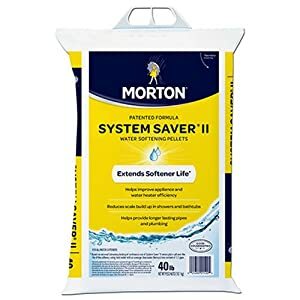 The Morton System Saver II Water Softening Pellets is our preferred choice. In certain situations, potassium chloride may be used for softener regeneration instead of sodium chloride. The advantage of potassium chloride is that the softened water contains no sodium. Substituting potassium chloride for sodium chloride may be appropriate if health or environmental reasons necessitate restricting sodium. If you’re on a very low-sodium diet and you’re concerned about the amount of sodium in softened water, we’d recommend you consider a water softener that uses potassium chloride as an alternative to sodium chloride. Most water softeners, whole house water softeners, from top water softener brands like Fleck, Pentair, ABCwaters, Discount Water Softeners, Whirlpool, or Culligan, now can use potassium chloride instead of sodium chloride. The disadvantage of potassium chloride is it can be more costly and more difficult to obtain than sodium chloride. Potassium chloride also adheres more strongly to the resin. This can reduce the exchange efficiency compared to sodium chloride and require more potassium chloride. 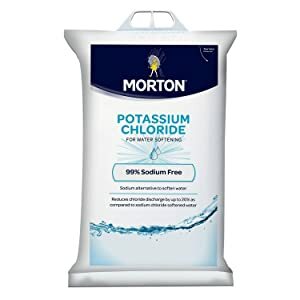 Morton Potassium Chloride Pellets are a great choice if you’re looking for Potassium Chloride for your water softener. How to Choose the Right Water Softener Size? Before you purchase a water softener, there are several important things you need to know to find the right model for your family’s needs. Knowing your water hardness is vital to purchasing the best water softener for your home. Guessing at this number will result in an improperly sized system. Also, when it comes time to programming your softener it will ask for the hardness value. Water hardness often is expressed as grains of hardness per gallon of water (gpg), or milligrams of hardness per liter of water (mg/L), or parts per million (ppm). One grain of hardness is equal to 1/7,000 pound of rock or equal to 17.1 mg/L or 17.1 ppm. Hardness ions are typically combined with sulfate, chloride, carbonate, or bicarbonate ions. For consistency, concentrations are generally converted to the equivalent concentration as calcium carbonate (CaCO3 ) and expressed in terms of hardness as calcium carbonate. How do I determine my Water Hardness? You can contact a water testing company to perform the test or you can purchase a home test kit. A variety of water hardness test kits are available for purchase. They are generally easy to use, relatively inexpensive, and can provide a good estimate of hardness. Laboratory tests should be considered if more accurate measurements are needed. Many companies that sell water treatment equipment offer hardness tests. When using these water test kits, be certain you understand the nature of the test, the water condition being measured, and the significance of the test results. 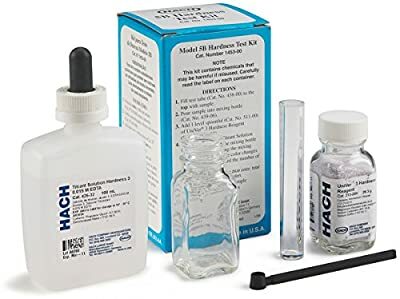 One of the best water hardness test kits on the market is the Hach 145300 Total Hardness Test Kit. This kit is easy to use and provides instant results. After having the water hardness, capacity is the next thing you should look for in a water softener. The best water softener for you should be large enough to handle the needs of your family, yet not so large that you are paying for unnecessary capacity. The average family uses 80 to 100 gallons of water per person per day. That means a household of 4-5 people requires 400 gallons of softened water daily. If your water has a hardness rating of 15 grains per gallon, for example, you would need to remove 6,000 grains per day (400 gallons x 15 grains). A softener is usually sized to regenerate about once per week, your minimum softener capacity would be 42,000 grains (6,000 grains x 7 days). Why once per week? A once-a-week regeneration strikes a good balance between keeping the resin bed fresh and not exerting excessive wear and tear on the valve. A water softener valve contains moving parts but these parts only move when the softener is regenerating. Regenerating once-a-week also keeps the water consumption low. Sizing a water softener system may seem simple but there are many factors to consider. A family of five that uses about 400 gallons of soft water daily at a hardness rating of 15 gpg results in weekly softened water capacity need of about 42,000 grains. A 42,000-grain whole house water softener seems to fill the need perfectly. However, there will be periods of time where 70-80% of your daily water usage can be utilized for showers, dishwasher, toilets flushing, kitchen sinks, and even a washing machine – if all these things use soft water simultaneously, your system wouldn’t have enough capacity because the water flow through the softener exceeds its ability to soften. To make sure you don’t run out of soft water during peak hours or between regenerations, you should always upsize your water softener system. If you are researching water softener options you may have read about the different types of resin that can be used in a water softener. Each type is designed for specific applications and conditions that affect its utilization. There are 3 common types of water softener resin available on the market: 8% cross-link resin, 10% cross-linked resin, and fine mesh resin. Water softener resins used in a majority of water softeners are 8% or 10% cross-linked resin beads. Crosslinking refers to the amount of divinylbenzene (DVB) used in manufacturing. In simple terms, DVB determines the strength of the beads. 8% cross-link resin is usually less expensive than a 10% cross-linked resin, though it may break down at a faster rate. 10% cross-linked resin yields a slight disadvantage of economics to 8% when new, but holds its structure longer by resisting the effects of chlorine and other oxidizers. Additionally, 10% cross-linked resin is stronger and less susceptible to hydraulic and osmotic shock. Over the life of the resin bed, 10% loses capacity at a much slower rate than 8%, making 10-percent resin a better choice for waters containing oxidants, chlorine, and systems with hydraulic-shock issues. As mentioned earlier, fine mesh resins are ideal for well water. Fine mesh resin also removes hardness but is preferred for removal of iron from well water. 8% and 10% cross-linked resins also remove iron, but fine mesh resin does it better. The disadvantage of fine mesh resin over cross-link resin is that fine mesh resin reduces service flow. You cannot simply put fine mesh resin into a standard water softener unit. You’ll need to change to a more restrictive riser basket to avoid loss of resin. Summary: if you’re on city water, the best water softener resin for you is cross-link resin. If you’re on well water with a lot of iron, the best water softener resin for you is fine mesh resin.